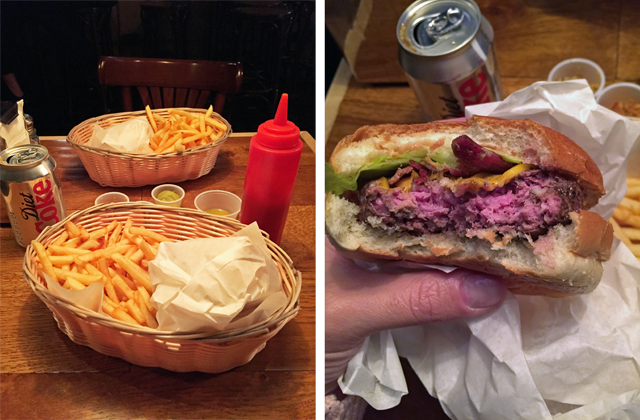 When someone tells me I'm in for the best burger in London, I enter a restaurant with expectations. Now, looking back, I'm starting to think I walk in the door with somewhat unfair expectations, actually. I've had more burgers in London than I can count and each time I've been seated for an experience, it seems my ham-burglar in crime claims they've found the holy grail of burgers. And each time I end up saying the same thing - "sorry, MEATLiquor is still the best burger in London." I wish I could say this experience was different. 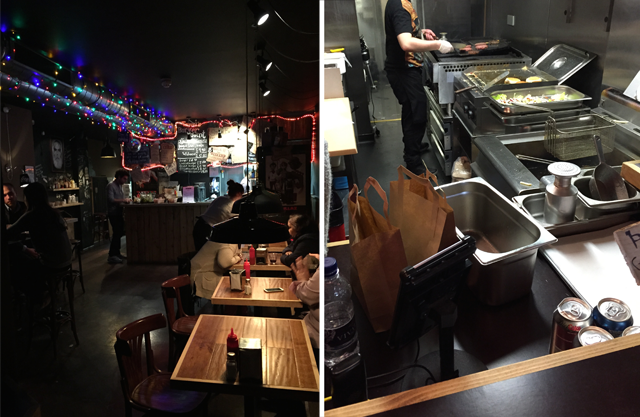 I visited Tommi's Burgers, on the Kings Road in London, with such high expectations. I had been given a few opinions of Tommi's Burgers before dining. Some said it was average, others raved about the 'gers. But I had to try them for myself. So last night, Sunday evening, I made my way over to Tommi's. I had heard it was a very busy little burger shack and I estimated Sunday night around 8pm would be the easiest time to get a table for some burger sampling. My timing was perfect. The restaurant was just starting to clear around 8:30 and we could have our pick of the tables. Upon entering, you have to order at the counter before taking a seat. I, along with my burger guru for the evening, ordered the "deal of the century." This is the classic burger with fries and a can of soda for £9.90. Not bad pricing, I suppose. It's pretty bad that I think that's a decently priced burger in London, but this is London and nothing good seems to come cheap these days. £9.90 is still a decent expenditure for a dinner out on the town. A few points scored there, Tommi. Where they lost the points was in the service at the counter. The young lady at the till seemed she'd rather be anywhere else than there. There was a friendly joke made to lighten the mood that was quickly turned on it's head and we couldn't move away fast enough. A very strange encounter indeed. We took our seats, chatting and looking around the tiny place, as we waited for our food to be delivered to the table. You leave your name at the till and they come find you with your food when it's ready - fair enough. The atmosphere was friendly and chilled to the max. This is definitely the ideal burger venue vibe. You're relaxed and taking it all in as your mouth starts to water thinking of a delicious burger winging its way to you. After a short time, and a turn down of a group of burgers intended for a customer called Rebecca, our burgers arrived. Wrapped in white paper, the burger sat comfortably aside an order of string fries. The fries themselves were standard fries, nothing special but the usual goodness of salty strings that usually accompanies a grand meat feast. Unwrapping the burger I discovered a marvelous looking creation. A great buttered bun held a big beefy patty covered in ketchup, onions, bacon and more. 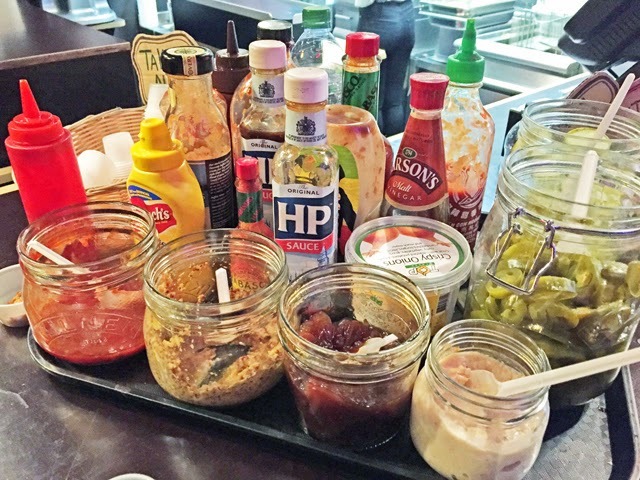 Should you wish to add anything additionally, the house has a wide variety of sauces next to the ordering kiosk that are begging for attention from the get-go. I am a burger purist. Leave it to ketchup and a few veggies and I'm a happy lady. So this is where I have to mention again that I believe I entered Tommi's Burgers with unfair expectations. I had been told it was the best burger in London. I expected fireworks with the first bite. Angels would sing, dogs would howl, etc etc. Instead, my reply to my dinner companion was, "yeah, this is pretty good." That was all it took and we found ourselves in a deep discussion as to what was missing. The burger ticked all the right boxes for presentation, ingredients, etc. So why wasn't it making my tastebuds sing? Then it hit me. What is it that makes a great burger everywhere else? Usually, it's the taste of the meat. There's always some little kick or secret ingredient mixed into the patties. It's a subtle twist which gives the burger a kick and gives each establishment an edge when it comes to their burgers. The meat is the trick. This meat, at Tommi's burgers, was good... but it wasn't memorable. I left saddened, but have made a decision moving forward. I'm, first of all, not giving up. I'm going to visit Tommi's Burgers on Thayer Street and see if there's any difference. Maybe it was just an off night. Secondly, I'm giving up the idea that I'll ever discover another burger that's the "best burger in London." I'm just setting any burger joint up for failure from the start. 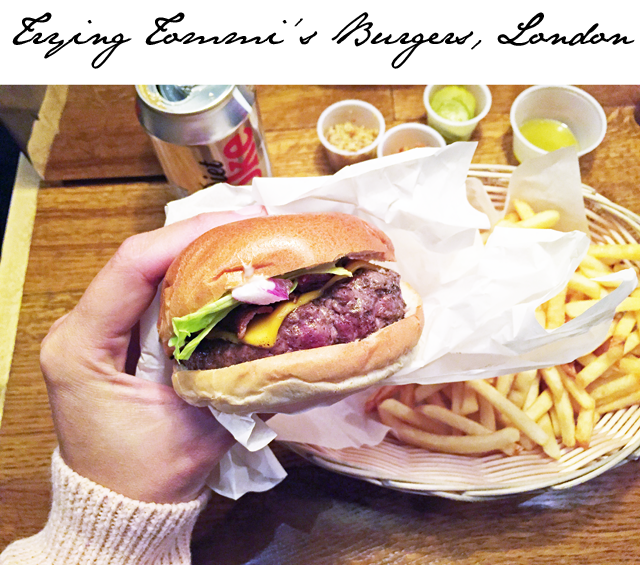 So here's my final verdict on Tommi's Burgers in London. I'm a girl who likes flavor in her burger. If you're the sort of burger fan that likes a plain, simple and straightforward slice of beef, I think you may find yourself perfectly pleased with what Tommi's Burgers is presenting. The atmosphere is fun and mostly friendly. As my dad always used to say, "it beats a sharp stick in the eye." Tommi's, I'll be back. 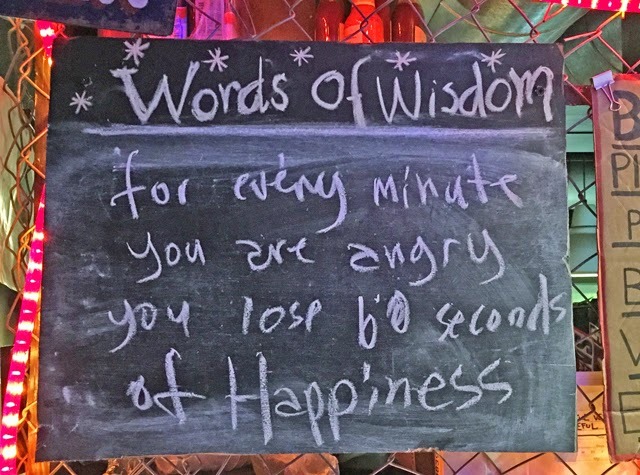 Have to say, however, that I did love your decor as well as your words of wisdom... brilliant. 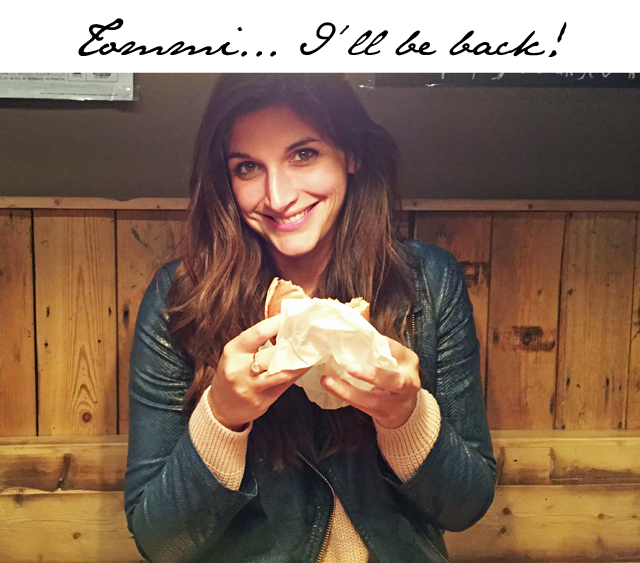 Would love to hear your thoughts - whether you have tried or will try Tommi's - dear readers.